Miura Taro (*1945) is a professional shakuhachi maker based in Mie-ken, Japan. 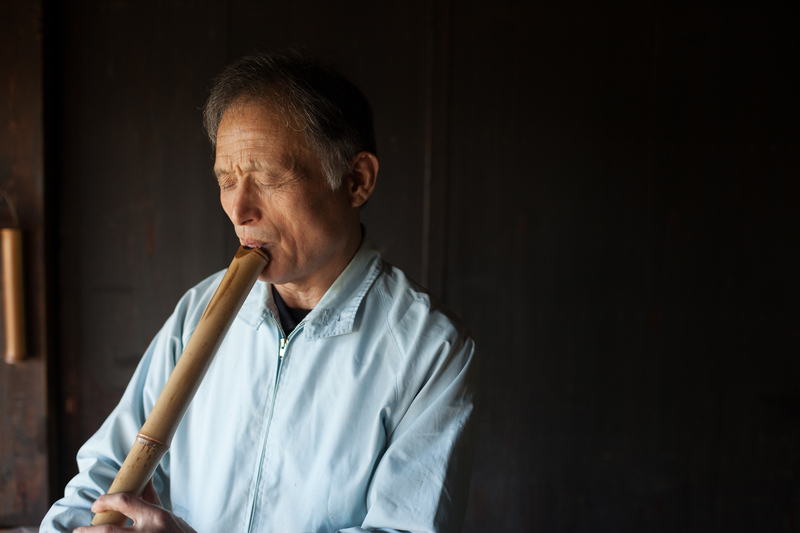 Mr. Taro has been playing the shakuhachi for 54 years and started making them in 1975. His flutes are made to modern standards in terms of tuning and projection and are sold in the price range from one to seven thousand USD. He also makes jinashi shakuhachi, hitoyogiri shakuhachi and gagaku shakuhachi. Outside of making shakuhachi, Miura Taro is a poet and a holder of Renshi 6th Dan in kyudo (archery) awarded by All Nippon Kyudo Federation. Over three days, you will be cutting, drilling and filing bamboo under supervision of a Japanese maker to make one or two jinashi shakuhachi. Miura Taro will show you how to properly insert the utaguchi inlay and will be open to any consultations regarding repairs or specific problems a shakuhachi can have. Mr. Taro kindly offered bamboo from his private reserve to be used in the workshop (please see the conditions below). In Studio Neiro, you will be provided with the necessary making tools, but you are welcome to bring your own. This is a unique opportunity to learn shakuhachi making and meet a person who dedicated his life to shakuhachi and other distinguished Japanese arts, poetry and archery. The workshop capacity is five people only, because of this makers of all levels are welcome, even absolute beginners. There will be time enough for everyone. To ensure an intensive experience, the workshop is open to 5 participants only. *ISFP Family is a member programme of the International Shakuhachi Festival Prague. Learn more here. High quality bamboo from Miura Taro’s private reserve can be ordered at approx. 15,000 to 28,000 Yen / piece. Please, let us know the desired length of the bamboo and indicate desired distances between the holes (see the picture below), so that Mr. Taro can select the bamboo with the best node placement. Please bring a case to bring your flutes back home. If you have your own favourite set of tools you are welcome to bring it. Standard drills, files and saws will be provided. Translation from Japanese to English and Czech will be provided. You will be able to use the room and tools outside of the workshop hours.